Why did climate cool in the mid-20th Century? 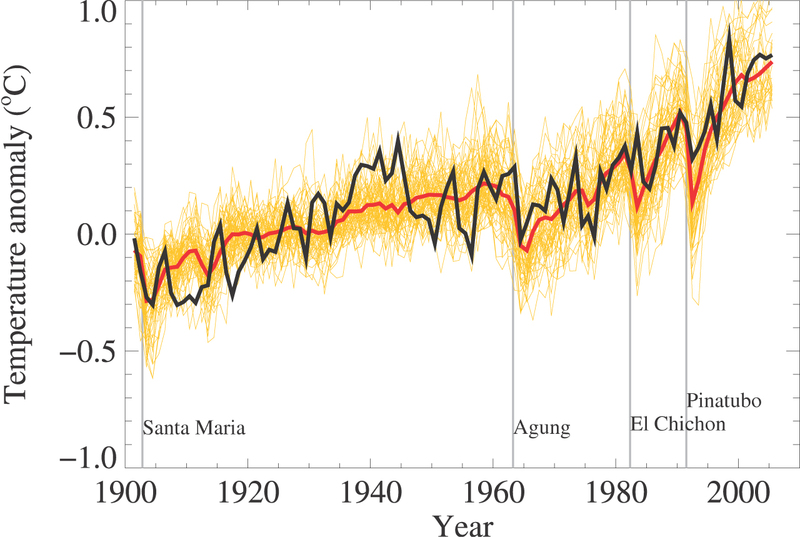 The average global surface temperature decreased slightly from 1940 to 1975. The main reason behind this mid-century cooling was global dimming due to anthropogenic sulfate aerosol emissions. There was a very slight cooling in the average global surface temperature from about 1940 to 1975. 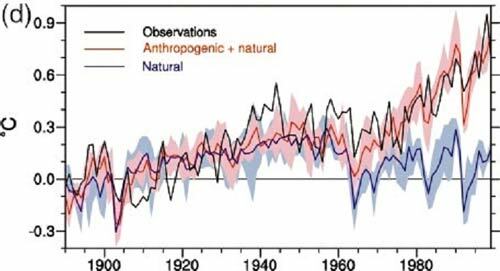 Although the global temperature only decreased by approximately 0.1°C, this period represents a divergence from the warming periods of 1915 to 1940 and 1975 to Present. Climate scientists believe that the primary cause of this mid-century cooling was an increase in atmospheric aerosols due to anthropogenic emissions (primarily from the burning of fossil fuels). Aerosols have a complex effect on the climate, because they have both direct and indirect impacts. The direct effect of aerosols on climate is the mechanism by which aerosols scatter and absorb shortwave and longwave radiation (a.k.a. "global dimming"), thereby altering the radiative balance of the Earth-atmosphere system. The key parameters for determining the direct aerosol radiative forcing are the aerosol optical properties and distribution in the atmosphere (IPCC 2007). The indirect effect of aerosols on climate is the mechanism by which they modify the microphysical and, therefore, radiative properties, amount, and lifetime of clouds. A key parameter for determining the indirect effect of aerosols on the global surface temperature is the effectiveness of an aerosol particle to act as a cloud condensation nucleus - a function of the aerosol size, chemical composition, mixing state, and ambient environment (IPCC 2007). We can attempt to quantify the impact of anthropogenic aerosol emissions on the average global temperature by first examining the associated radiative forcing. The radiative forcing is a measure of the influence that a factor has in altering the balance of incoming and outgoing energy in the Earth-atmosphere system. According to the IPCC, the total (direct + indirect) radiative forcing due to anthropogenic aerosols could range anywhere from -0.4 to -2.7 Watts per square meter (W/m2), although the most likely value is -1.2 W/m2. The general natural baseline is around 30 ppb, with a rise to about 65 ppb in the early 20th century. 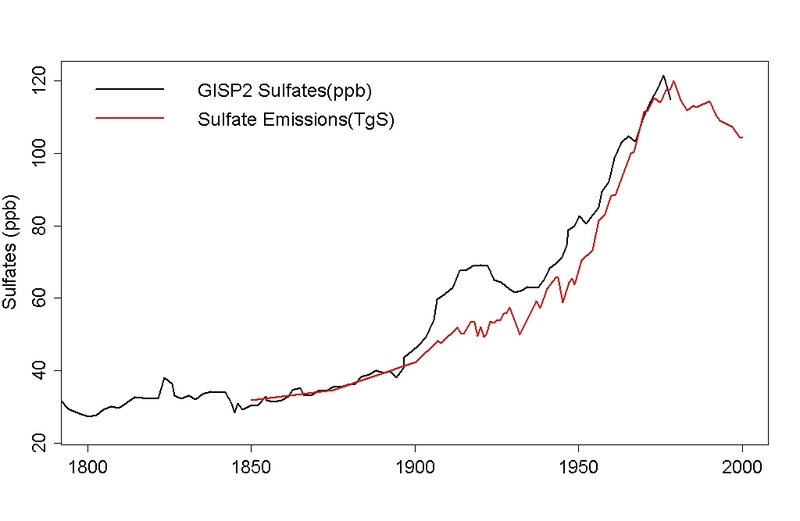 Then from 1945 to 1970 (the mid-century period in question), atmospheric sulfate concentration increased from 65 to 120 ppb. This tells us that approximately 60% of the total sulfate increase since 1800 occurred during the mid-century cooling period. The change in reflected solar flux is proportional to the optical thickness of the aerosol layer (Charlson et al. 1991). where FR is reflected solar flux, Qo is the solar constant (total solar irradiance), Ti is the atmospheric transmittance, Ac is the fractional coverage of clouds, β is the fraction of upward scattered flux, and δ is the optical thickness. Using Qo = 1366 W/m2, Ac = 0.61 for globally averaged cloud cover, Ti = 0.76, and Rs = 0.15 (see Charlson 1991 for references to the sources of these values), FR is approximately 32 times the optical thickness δ. Charlson et al. estimate the optical thickness as the product of the aerosol burden and mass scattering coefficient, and find for cloudless skies, the optical thickness is approximately 2.8x10-2. Thus from the formula above, the reflected solar flux is approximately 0.9 W/m2, which is on the high end of the IPCC range of values for the direct aerosol forcing. The indirect sulfate effect on cloud formation is more complex, but we'll proceed under the assumption that the total sulfate radiative forcing is approximately proportional to the atmospheric sulfate aerosol concentration, in order to come up with a ballpark estimate regarding its impact on mid-century cooling. In other words, we'll assume that a 60% increase in atmospheric sulfate concentration corresponds to a 60% increase in radiative forcing. Also note that sulfates are not the only anthropogenic aerosols, but do comprise the majority of the radiative forcing. Another signature of aerosol cooling offsetting greenhouse gas warming is the continued increase in daily minimum, nighttime temperatures while the maximum, daytime temperatures drop. This is because aerosols cause global dimming by scattering sunlight; an effect which is much more influential during the day when solar radiation is bombarding the Earth's surface. At night, greenhouse gases continue to absorb and re-radiate thermal radiation from the Earth's surface, which causes the nighttime surface temperatures to continue warming despite the cooling daytime temperatures due to the aerosol dimming. Wild et al. (2007) investigated these effects and found that from 1958 to 1985, daytime land surface temperatures cooled at a rate of -0.04°C per decade, but nighttime temperatures warmed at a rate of 0.11°C per decade. From 1982 to 2002, they found that daytime land surface temperatures warmed at a rate of 0.37°C per decade, while nighttime temperatures warmed by 0.40°C per decade. The fact that nighttime temperatures continued to warm while daytime temperatures cooled mid-century is a strong indicator of the combined effects of anthropogenic aerosol and greenhouse gas emissions, while the increased rate of warming over the past 3 decades reflects the increasing atmospheric concentration and radiative forcing from greenhouse gases. Clearly since about 1975, global surface temperatures have trended rapidly upwards (at a rate of nearly 0.2°C per decade). So what caused the mid-century cooling to end? The main cause of the sudden shift in global temperature trends was the passage of Clean Air Acts by various countries in response to air pollution and acid rain. The USA, for example, first passed its Clean Air Act in 1970, with amendments in 1977 and 1990. Coincidentally, the US Supreme Court (in Massachusetts v. EPA) and EPA (in an endangerment finding) also recently decided that greenhouse gases qualify as 'air pollutants' in the Clean Air Act and must be regulated accordingly. Meanwhile anthropogenic greenhouse gas emissions have continued to increase. Since 1975, the atmospheric CO2 concentration alone has increased from 331 to 392 parts per million by volume, which corresponds to a temperature increase of about 0.7°C, though we've only seen about 0.55°C warming over that period due to the thermal inertia of the oceans and 'warming in the pipeline'. 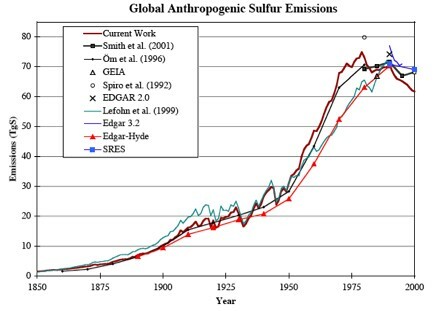 To sum up, anthropogenic sulfur emissions appear to be the main cause of the mid-century cooling. These emissions decreased the mean global surface temperature by approximately 0.5°C during this period, while anthropogenic greenhouse gas emissions caused a warming of approximately 0.4°C. Therefore, even though greenhouse gas emissions continued to have a warming effect during this period, it was more than offset (hidden) by anthropogenic aerosol emissions, until those emissions were brought under control by government intervention while greenhouse gas emissions continued to increase unabated. In other words, the mid-century cooling is actually an expected result based on our current understanding of climate science, and is successfully hindcasted by climate models (Meehl 2004). However, the overall impact of sulfate aerosols, particularly due to their indirect effects via cloud formation, remain a significant source of uncertainty. Despite this uncertainty, they remain the likely dominant cause of the slight mid-20th century cooling. Open Mind has an interesting post Hemispheres that compares temperature records for both hemispheres over the past century and the significance for mid-century cooling. John, recently on Irregular Climate you mentioned that in the mid-20th century, although the daily maximum temperature decreased, the daily minimum temperature increased. Can you add links to that evidence here? Thank you. Response: Always making work for me, aren't you James? Here's the original blog post about daily minimum temperatures increasing during mid-century cooling. I've integrated the blog post into the above info. Thanks for the suggestion (your ideas while making work for me are always good ideas). How does this relate to this recent article? The story suggests that sea temperatures actually did decrease sharply around this period of time, if I'm reading it right. I haven't read the details in Nature, so I haven't seen the details. It seems to contrast with some of what you have here. that paper may add something to the mechanism illustrated here, they're not mutually exclusive. "As a final point, it should be noted that in 1945, the way in which sea temperatures were measured changed, leading to a substantial drop in apparent temperatures. Once the data are corrected, it is expected that the cooling trend in the middle of the century will be less pronounced." "The international team of scientists discovered an unexpectedly abrupt cooling event that occurred between roughly 1968 and 1972 in Northern Hemisphere ocean temperatures. The research indicates that the cooling played a key role in the different rates of warming seen in the Northern and Southern Hemispheres in the middle 20th century"
That seems prety much mutually exclusive to me. These both seem to be pro-global warming stories, so it doesn't really matter which one is right as far as I'm concerned. The matter of increased night-time temperatures also seems to be inconsistent with an actual drop in sea temperature. I actually wonder if the guys in the new story are serious. The theory here on this site seems to make more sense and seems to be more supported by known facts. if you're looking for pre-cooked anti-AGW informations, you're in the wrong place. If you're not interested in the science, again you're in the wrong place. And given that you definitely are in the wrong place, I do not understand why you ask questions. The temperature variations according to NOAA/NCDC dataset from 1880-2010 vs rising CO2 levels indicate no significant impact from CO2. However, the day/night variations explained above appear to be legitimate science and I applaud them for their work. The real worry may not be so much CO2 but a possible sudden release of Methane Hydrate from the sea bottoms and tundra bogs of Siberia. #7: "show no significant impact from CO2"
That's absolutely incorrect, as the graph below (from NOAA/NCDC clearly shows). Where do you come up with such silliness? And of course, you're off topic. Find the appropriate threads using the search function. muoncounter : I would call this figure an unconvincing correlation, since the slope in the 1900-1940 period is quite comparable to the modern one, although CO2 was very different. Response: [Dikran Marsupial] yes, indeed, but CO2 is not the only forcing, not all warming is caaused by CO2 and nobody claims it is. Correlation isn't what it is about. 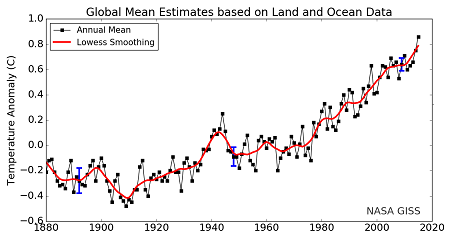 The question is whether modelled temperatures using estimated forcing match the actual record. See IPCC WG1 for the answer. a) curves are generated by a variety of different models, which is really strange, since it means that different modelling can produce the same kind of visual output - this really means that observations are only LOOSELY constraining models - which is the opposite of a scientific validation. b) the models contain parameters , especially for clouds, so there is an obvious selection bias due to the fact that bad models are simply not selected here. In other words, adding a superposition of approximate models with a selection of parameters giving results close to the data, will ALAWAYS produce an interval, a corridor , containing these data - it's almost certain and doesn't prove much. Note how curiously the black observed curve travels throughout the corridor and never crosses the border : is it not surprising that a unbiased set of models just reproduces exactly the range of natural variability, without any "lost space" in the yellow interval or without the black curve goint out of it? this cannot for sure be obtained without a selection of the sample. c) models produce temperature that are not precisely matching the reality in absolute. What is displayed here is ANOMALIES. Anomalies with respect to which baseline ? you have to read carefully the report to find the answer : with respect to the 1900-1950 period. So the agreement at least on the central point of the first half is automatically insured - no surprise here. So the real test of the preanthropic period is not the average value, but the details of the shape around this value. Is it well reproduced ? not so much. The break around 1940 is NOT reproduced in models - it just the width of the interval that blurs out the comparison. The only break in the models are in major volcanic eruptions - first Agung in 1963. Note also that volcanic eruptions are NOT so conspicuous in data. Actually if you look only at data, you couldn't say when these eruptions occured, contrary to the models. So it seems that models "play" with eruptions to try to reproduce breaks that are not really at the right place - playing with a whole interval of parameters to blur out the disagreement. That is not, by far, what I would call an accurate fit of data. (a) No, the use of multiple models is not "really strage", it is not even unusual. There is uncertainty in the details of the physic is involved and in the parameters, the use of multiple models captures some of that uncertainty. Secondly if different models give similar results, that indicates that the uncertainty in the physics is small and the climate projections are not greatly sensitive to them. That is a good thing from the modelling point of view, not a bad one. If anything it actually means the data do constrain the models relatively tightly as it constrains them all to say the same basic thing. As to scientific validation, you obviously don't understand there is no such thing as scientific validation, only scientific invalidation. You can't prove a theory right, only disprove it. (b) Complaining that bad models are not selected is pretty daft, if the model is inconsistent with reality it means the assumptions underpinning that model are incorrect, so why should we look at it. The CMIP ensemble were not selected in that way, it is an ensemble of models from leading modelling groups, so your objection is incorrect anyway. Complaining that the black line doesn't go out of the corridor is basically saying "the models must be wrong because they give the right answer"! (c) The models should not expect to produce temperatures that precisely match the observations, that comment shows a complete lack of understanding of Monte Carlo simulation methods. We can't predict the chaotic weather, so the model runs will always be different. The model mean won't match the observations either as it is an estimate of only the forced component of climate, not the unforced response - the observed climate has both components so there is no reason to expect that close a match. "That is not, by far, what I would call an accurate fit of data" well possibly that is because you don't understand the effects of the major sources of uncertainty. Given internal climate variability (which models cannot be expected to be able to model), the hindcast is pretty impressive. However, I suspect this should be discussed further on another thread. and, indeed, was touched on previously in the Climate Sensitivity: The Skeptic Endgame where Giles didn't understand it either. Response: (Daniel Bailey) Are you offering...? And try comparing vs something else than GISS which is showing less cooling in mid 1900's and also less warming pre 1940. Like Hadcrut which has not been so heavily adjusted by the modelers. Between 1944 and 1980 there were more than 1800 nuclear explosions were conducted - many above ground - including the biggest H-bombs. This time period was a mini-nuclear winter. Hmm, I'm skeptical. Any evidence that aerosol loading from tests and large enough and continuous enough to have a significant effect on aerosol loading compared to industrial emissions? "Any evidence that aerosol loading from tests and large enough and continuous enough to have a significant effect..."
Not much. It takes a yield of at least 50 ktons to make a cloud tall enough to reach the stratosphere. Large yield testing didn't begin until 1952; mid-century cooling started several years prior to that (there's a lag problem). And the USGS shows that it is not dust as much as sulfate aerosol that causes detectable multi-year cooling. About the only significant climate-scale result from nuclear testing is the C14 spike. 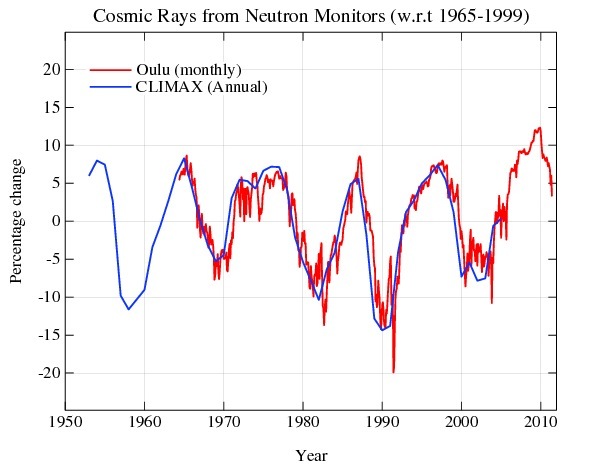 And that doesn't make a blip in the older cosmic ray records. I have heard it said that the Pacific decadal oscillation superimposes a sine wave of variation onto the underlying warming trend line, http://en.wikipedia.org/wiki/File:PDO.svg and that this correlates to the multidecadal variation of the rate of rise. Is there research that supports this? 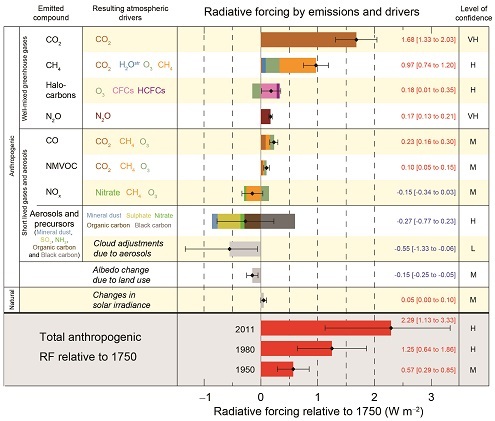 Here's an updated version of the 'Radiative Forcing since 1750' chart. There is even a section that shows the forcing in 1950 relative to 1750. It is NOT negative. Though I strongly suspect that since reconstruction of past aerosol concentrations and their effects on radiative forcing going back to 1750 is highly controversial and involves a lot of errors. Either way, the IPCC's AR5 version of that chart does not seem to support the notion that aerosols exerted enoguh negative forcing to contribute to a slight cooling trend. So NOW cfs's are going to COOL the planet? This is the FIRST time I've ever heard anyone make that claim. CFS's area greenhouse gas and were linked to warming not cooling. Make up your mind. Please read the OP again. I believe you mean CFC's not CFS's. As you claim, CFC's warm the planet. The OP does not mention CFC's. Sulfate aerosols cool the planet. These aerosols were emitted in large quantities during the mid centuary industrialization due primarily to coal burning. When the USA and Europe got tired of toxic air pollution in the 1970's and controlled aerosols the underlying warming became evident. China and India currently emit large amounts of aerosols which cool the planet and mask part of the CO2 caused warming. Unfortunately, these aerosols are poorly measured and the exact magnitude of the effect is poorly bounded. If you want to learn more post again, we are happy to help you increase your AGW knowledge. Somebody should answer Chuck's question about PDO. I'd like to know too. 1/ PDO does not appear to be a single ocean dynamic feature but rather the expression of the sum of multiple underlying dynamics. 2/ The PDO is inherently detrended. ie global average SST is substacted from the Pacific SST in calculating the index.